This section will cover fundamental concepts for creating effective data visualization and will introduce tools and techniques for visualizing large, high-dimensional data using R. We will review fundamental concepts for visually displaying quantitative information, such as using series of small multiples, avoiding “chart-junk,” and maximizing the data-ink ratio. We will cover the grammar of graphics (geoms, aesthetics, stats, and faceting), and using the ggplot2 package to create plots layer-by-layer. This lesson assumes a basic familiarity with R, data frames, and manipulating data with dplyr and %>%. We’re going to work with a different dataset for this section. It’s a cleaned-up excerpt from the Gapminder data. Download the gapminder.csv data by clicking here or using the link above. Let’s read in the data to an object called gm and take a look with View. Remember, we need to load both the dplyr and readr packages for efficiently reading in and displaying this data. ##  1 Afghanistan Asia       1952    28.8  8425333      779. ##  2 Afghanistan Asia       1957    30.3  9240934      821. ##  3 Afghanistan Asia       1962    32.0 10267083      853. ##  4 Afghanistan Asia       1967    34.0 11537966      836. ##  5 Afghanistan Asia       1972    36.1 13079460      740. ##  6 Afghanistan Asia       1977    38.4 14880372      786. ##  7 Afghanistan Asia       1982    39.9 12881816      978. ##  8 Afghanistan Asia       1987    40.8 13867957      852. ##  9 Afghanistan Asia       1992    41.7 16317921      649. ## 10 Afghanistan Asia       1997    41.8 22227415      635. # Optionally bring up data in a viewer window. 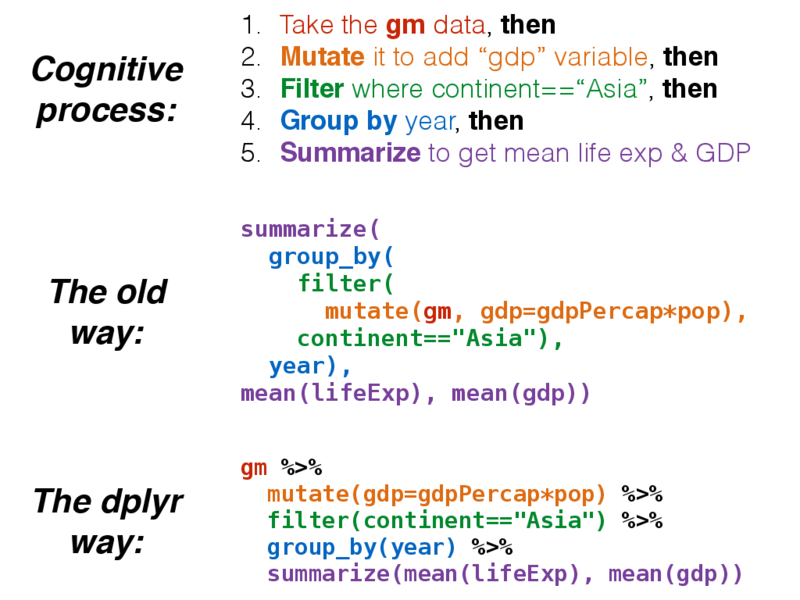 The dplyr package gives you a handful of useful verbs for managing data. On their own they don’t do anything that base R can’t do. Here are some of the single-table verbs we’ll be working with in this lesson (single-table meaning that they only work on a single table – contrast that to two-table verbs used for joining data together). They all take a data.frame or tbl as their input for the first argument, and they all return a data.frame or tbl as output. group_by(): groups a data frame by one or more variable. Most data operations are useful done on groups defined by variables in the the dataset. The group_by function takes an existing data frame and converts it into a grouped data frame where summarize() operations are performed by group. Additionally, the %>% operator allows you to “chain” operations together. Rather than nesting functions inside out, the %>% operator allows you to write operations left-to-right, top-to-bottom. Let’s say we wanted to get the average life expectancy and GDP (not GDP per capita) for Asian countries for each year. ##  1  1952            46.3  34095762661. ##  2  1957            49.3  47267432088. ##  3  1962            51.6  60136869012. ##  4  1967            54.7  84648519224. ##  5  1972            57.3 124385747313. ##  6  1977            59.6 159802590186. ##  7  1982            62.6 194429049919. ##  8  1987            64.9 241784763369. ##  9  1992            66.5 307100497486. ## 10  1997            68.0 387597655323. ## 11  2002            69.2 458042336179. ## 12  2007            70.7 627513635079.
ggplot2 is a widely used R package that extends R’s visualization capabilities. It takes the hassle out of things like creating legends, mapping other variables to scales like color, or faceting plots into small multiples. We’ll learn about what all these things mean shortly. Where does the “gg” in ggplot2 come from? The ggplot2 package provides an R implementation of Leland Wilkinson’s Grammar of Graphics (1999). The Grammar of Graphics allows you to think beyond the garden variety plot types (e.g. scatterplot, barplot) and the consider the components that make up a plot or graphic, such as how data are represented on the plot (as lines, points, etc. ), how variables are mapped to coordinates or plotting shape or color, what transformation or statistical summary is required, and so on. facets, which we’ve already seen above, that allow the data to be divided into chunks on the basis of other categorical or continuous variables and the same plot drawn for each chunk. First, a note about qplot(). The qplot() function is a quick and dirty way of making ggplot2 plots. You might see it if you look for help with ggplot2, and it’s even covered extensively in the ggplot2 book. 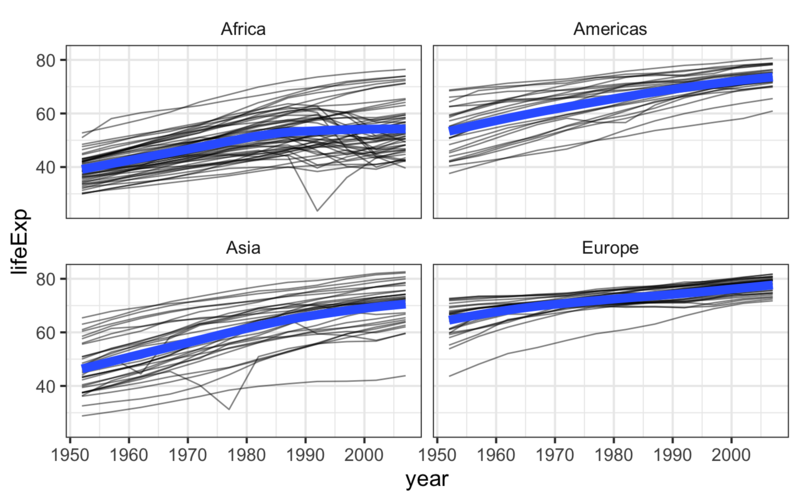 And if you’re used to making plots with built-in base graphics, the qplot() function will probably feel more familiar. But the sooner you abandon the qplot() syntax the sooner you’ll start to really understand ggplot2’s approach to building up plots layer by layer. So we’re not going to use it at all in this class. Finally, see this course’s help page for links to getting more help with ggplot2. The ggplot function has two required arguments: the data used for creating the plot, and an aesthetic mapping to describe how variables in said data are mapped to things we can see on the plot. Now, let’s lay out the plot. If we want to plot a continuous Y variable by a continuous X variable we’re probably most interested in a scatter plot. Here, we’re telling ggplot that we want to use the gm dataset, and the aesthetic mapping will map gdpPercap onto the x-axis and lifeExp onto the y-axis. Remember that the variable names are case sensitive! When we do that we get a blank canvas with no data showing (you might get an error if you’re using an old version of ggplot2). That’s because all we’ve done is laid out a two-dimensional plot specifying what goes on the x and y axes, but we haven’t told it what kind of geometric object to plot. The obvious choice here is a point. Check out docs.ggplot2.org to see what kind of geoms are available. Here, we’ve built our plot in layers. First, we create a canvas for plotting layers to come using the ggplot function, specifying which data to use (here, the gm data frame), and an aesthetic mapping of gdpPercap to the x-axis and lifeExp to the y-axis. We next add a layer to the plot, specifying a geom, or a way of visually representing the aesthetic mapping. Now, the typical workflow for building up a ggplot2 plot is to first construct the figure and save that to a variable (for example, p), and as you’re experimenting, you can continue to re-define the p object as you develop “keeper commands”. First, let’s construct the graphic. Notice that we don’t have to specify x= and y= if we specify the arguments in the correct order (x is first, y is second). The p object now contains the canvas, but nothing else. Try displaying it by just running p. Let’s experiment with adding points and a different scale to the x-axis. I like the look of using a log scale for the x-axis. Let’s make that stick. Now notice what I’ve saved to p at this point: only the basic plot layout and the log10 mapping on the x-axis. I didn’t save any layers yet because I want to fiddle around with the points for a bit first. 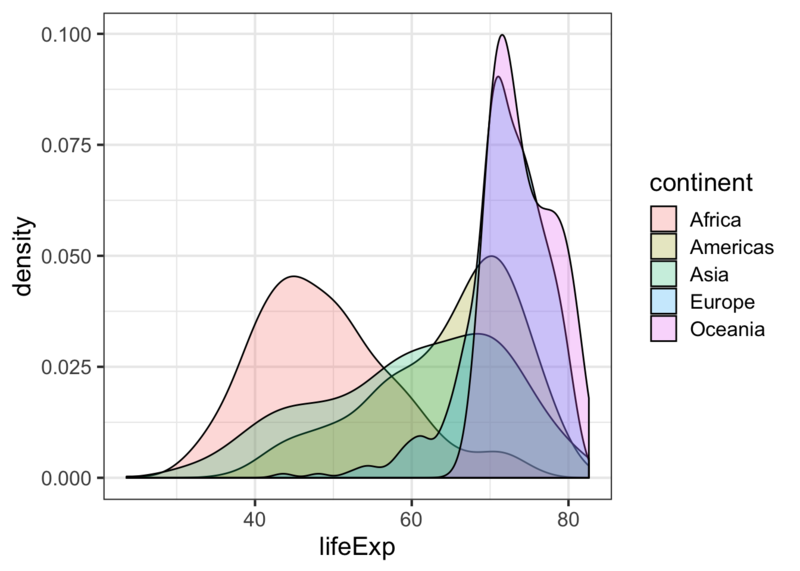 Above we implied the aesthetic mappings for the x- and y- axis should be gdpPercap and lifeExp, but we can also add aesthetic mappings to the geoms themselves. 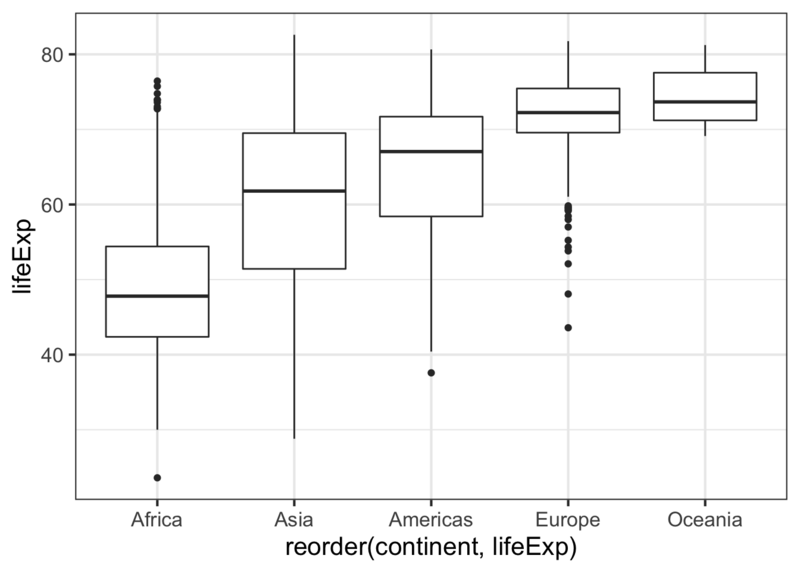 For instance, what if we wanted to color the points by the value of another variable in the dataset, say, continent? Now, this isn’t a great plot because there are several aesthetic mappings that are redundant. Life expectancy is mapped to both the y-axis and the size of the points – the size mapping is superfluous. Similarly, continent is mapped to both the color and the point character (the shape is superfluous). Let’s get rid of that, but let’s make the points a little bigger outsize of an aesthetic mapping. Re-create this same plot from scratch without saving anything to a variable. That is, start from the ggplot call. Start with the ggplot() function. Map gdpPercap to the x-axis and lifeExp to the y-axis. Use a log10 scale for the x-axis. Let’s add a fitted curve to the points. Recreate the plot in the p object if you need to. By default geom_smooth() will try to lowess for data with n<1000 or generalized additive models for data with n>1000. We can change that behavior by tweaking the parameters to use a thick red line, use a linear model instead of a GAM, and to turn off the standard error stripes. But let’s add back in our aesthetic mapping to the continents. Notice what happens here. We’re mapping continent as an aesthetic mapping to the color of the points only – so geom_smooth() still works only on the entire data. But notice what happens here: we make the call to aes() outside of the geom_point() call, and the continent variable gets mapped as an aesthetic to any further geoms. So here, we get separate smoothing lines for each continent. Let’s do it again but remove the standard error stripes and make the lines a bit thicker. Facets display subsets of the data in different panels. There are a couple ways to do this, but facet_wrap() tries to sensibly wrap a series of facets into a 2-dimensional grid of small multiples. Just give it a formula specifying which variables to facet by. We can continue adding more layers, such as smoothing. If you have a look at the help for ?facet_wrap() you’ll see that we can control how the wrapping is laid out. There are a few ways to save ggplots. The quickest way, that works in an interactive session, is to use the ggsave() function. You give it a file name and by default it saves the last plot that was printed to the screen. But if you’re running this through a script, the best way to do it is to pass ggsave() the object containing the plot that is meant to be saved. We can also adjust things like the width, height, and resolution. ggsave() also recognizes the name of the file extension and saves the appropriate kind of file. Let’s save a PDF. 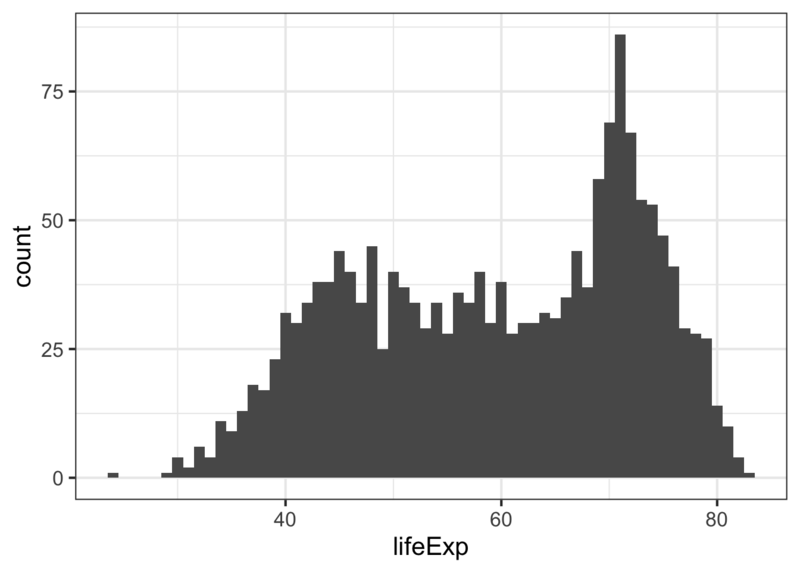 Make a scatter plot of lifeExp on the y-axis against year on the x. Make a series of small multiples faceting on continent. Add a fitted curve, smooth or lm, with and without facets. Bonus: using geom_line() and and aesthetic mapping country to group=, make a “spaghetti plot”, showing semitransparent lines connected for each country, faceted by continent. Add a smoothed loess curve with a thick (lwd=3) line with no standard error stripe. Reduce the opacity (alpha=) of the individual black lines. Don’t show Oceania countries (that is, filter() the data where continent!="Oceania" before you plot it). With the last example we examined the relationship between a continuous Y variable against a continuous X variable. A scatter plot was the obvious kind of data visualization. But what if we wanted to visualize a continuous Y variable against a categorical X variable? We sort of saw what that looked like in the last exercise. year is a continuous variable, but in this dataset, it’s broken up into 5-year segments, so you could almost think of each year as a categorical variable. But a better example would be life expectancy against continent or country. But that really only gets us so far. What if we spread things out by adding a little bit of horizontal noise (aka “jitter”) to the data. Note that the little bit of horizontal noise that’s added to the jitter is random. If you run that command over and over again, each time it will look slightly different. The idea is to visualize the density at each vertical position, and spreading out the points horizontally allows you to do that. If there were still lots of over-plotting you might think about adding some transparency by setting the alpha= value for the jitter. But why not show the summary and the raw data? Notice how in that example we first added the jitter layer then added the boxplot layer. But the boxplot is now superimposed over the jitter layer. Let’s make the jitter layer go on top. Also, go back to just the boxplots. Notice that the outliers are represented as points. But there’s no distinction between the outlier point from the boxplot geom and all the other points from the jitter geom. Let’s change that. Notice the British spelling. There’s another geom that’s useful here, called a voilin plot. Let’s go back to our boxplot for a moment. 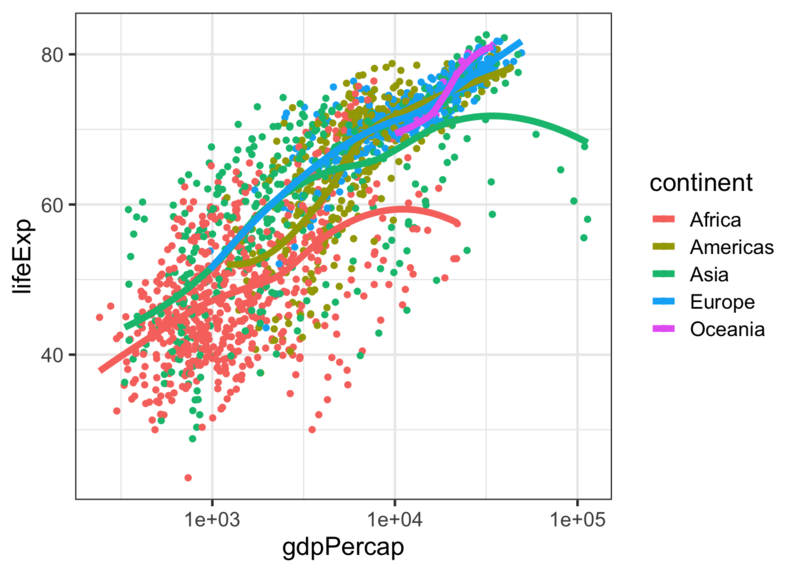 Make a jittered strip plot of GDP per capita against continent. 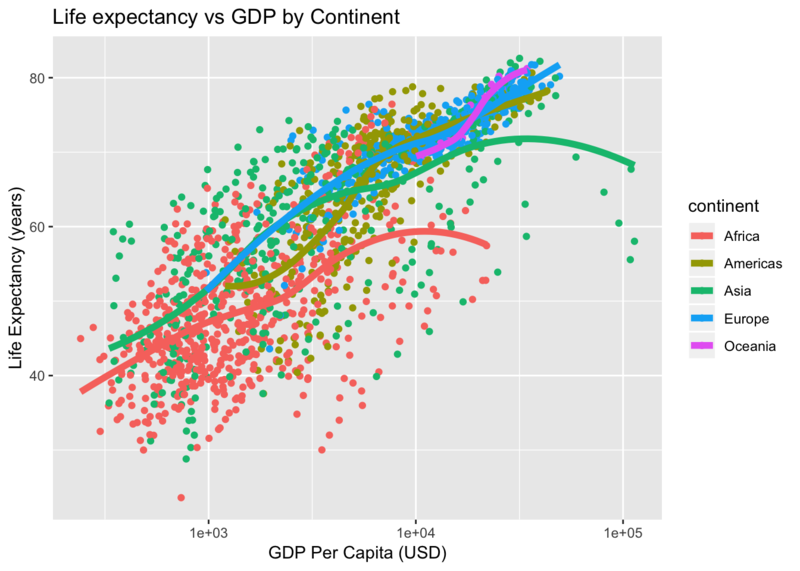 Make a box plot of GDP per capita against continent. Using a log10 y-axis scale, overlay semitransparent jittered points on top of box plots, where outlying points are colored. 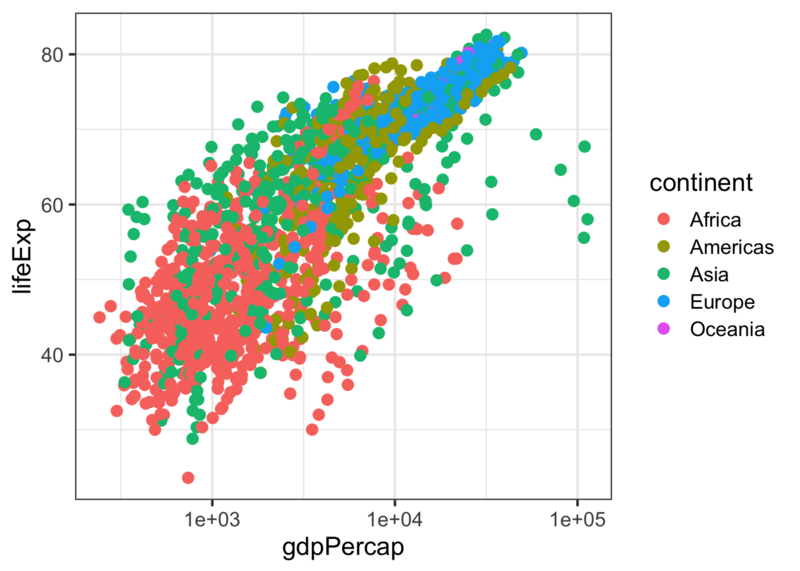 BONUS: Try to reorder the continents on the x-axis by GDP per capita. Why isn’t this working as expected? See ?reorder for clues. What if we just wanted to visualize distribution of a single continuous variable? A histogram is the usual go-to visualization. Here we only have one aesthetic mapping instead of two. When we do this ggplot lets us know that we’re automatically selecting the width of the bins, and we might want to think about this a little further. Back to histograms. What if we wanted to color this by continent? That’s not what we had in mind. That’s just the outline of the bars. We want to change the fill color of the bars. Well, that’s not exactly what we want either. If you look at the help for ?geom_histogram you’ll see that by default it stacks overlapping points. This isn’t really an effective visualization. Let’s change the position argument. But the problem there is that the histograms are blocking each other. What if we tried transparency? 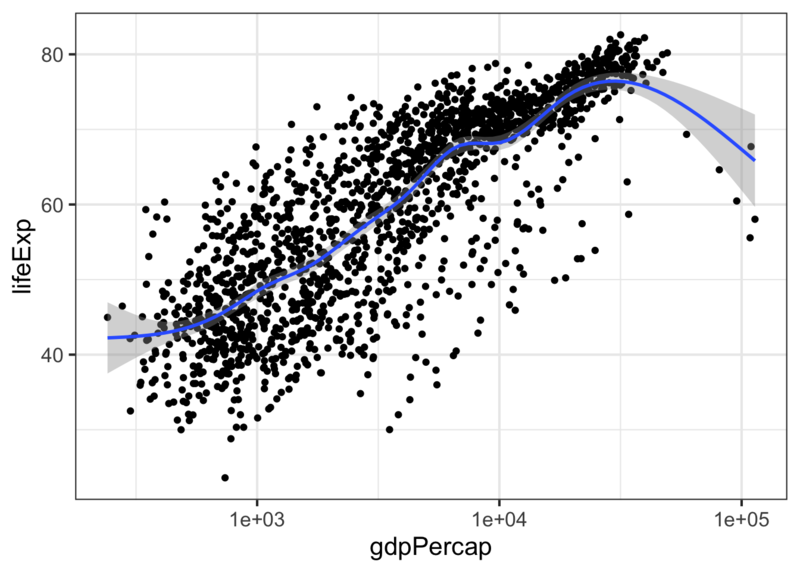 Plot a histogram of GDP Per Capita. Do the same but use a log10 x-axis. Still on the log10 x-axis scale, try a density plot mapping continent to the fill of each density distribution, and reduce the opacity. Still on the log10 x-axis scale, make a histogram faceted by continent and filled by continent. Facet with a single column (see ?facet_wrap for help). Save this figure to a 6x10 PDF file. By default, the “gray” theme is the usual background (I’ve changed this course website to use the black and white background for all images). Finally, there’s another package that gives us lots of different themes. Install it if you don’t have it already. Install all its dependencies along with it. Don’t forget - see this course’s help page for links to getting more help with ggplot2! Looking for more practice? Try this homework assignment.